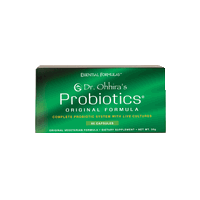 Dr. O’Hhira’s Probiotics contain 12 strains of beneficial bacteria, including E. faecalis TH, which has been shown scientifically to be 6.25 times stronger than any other known bacteria. The probiotic blend has been formulated according to ancient Japanese traditions and is contained within a proprietary vegetable capsule. This capsule allows the product to bypass stomach acid and prevents the need for refrigeration. Excellent for travel or people on-the-go.